INTRODUCING ZieglerWorld's line of Large Premium Shuffleboard Caps in 21 exciting colors! Now, for the first time, you can choose caps in your favorite team colors or your favorite colors! These caps fit ZieglerWorld and American Pucks! Our NEW, large shuffleboard caps fit pucks that are 2 5/16 inches in diameter (caps are 2 1/8 inches) and feature a unique label design to help gauge the spin speed of your shuffleboard weight throw. Note: ZieglerWorld caps are also made to fit American Pucks. They will NOT fit other brands besides Zieglerworld and American. The caps screw on to the base of the weight. When installing, twist very hard to ensure cap is flush with puck. Why Buy ZieglerWorld Replacement Caps? 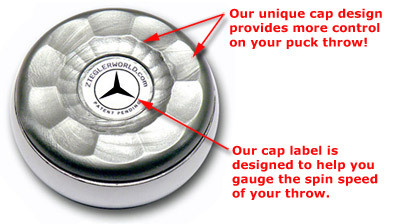 Note: ZieglerWorld caps are also made to fit American Pucks. They will NOT fit other brands besides Zieglerworld and American. The caps screw on to the based of the weight. When installing, twist very hard to ensure cap is flush with puck. We have other caps for many brands and sizes. Email us for pricing.